Alright, well, I’m obviously terrible at blogging. Total weight gain/loss: I don’t weigh myself frequently or regularly but I do believe I have put back on a handful of the pounds I lost in the first trimester. My guess would be that I’m not quite – but very close to being – back to my pre-pregnancy weight. Maternity clothes: Yes. I bought my first maternity shorts and pants this weekend. The Betabrand dress pant yoga pants are still totally do-able … I’m not really showing, but my regular pants don’t fit. I hit up Kohl’s a) because I had time to go, and b) because it was hot as balls (I’ve been told balls are very hot?) outside and I needed some shorts. I got the most comfortable shorts ever invented and I never plan to go back. In all seriousness though, it was really cool and exciting to see the people who liked or commented – not in a totally vain “I measure my worth in social media likes” kind of way, but more in a “it’s really nice to see people from my Catholic high school in Ohio be happy for me and my queer science baby” kind of way. Also in all seriousness, I am still such an awkward nerd when I tell people that I’m pregnant. I seem to be physically incapable of saying “I’m pregnant” without turning red and giggling like it’s a joke or something. I consult in a school on the side a couple of times per month, and I had decided that this past week I would tell them because the next time I go I’ll probably be showing and it’ll feel rude that I didn’t say anything before 18 weeks or something (I don’t know, that was my logic. Also I just decided that was the day). Anyway, they were leaving the classroom and kind of quickly told me that they didn’t need me to stay any longer so they were on their way out the door and I kind of shouted “I’m pregnant” at their backs. And proceeded to just laugh for like 5 minutes at the ridiculousness of the situation. And they were like, “are you serious?” because I’m sure it seemed very much like I wasn’t serious. And that’s a great example of how this has gone for me so far. I’m grateful to be at the point where most people know or are hearing it through the grapevine because I’m just not good at this part. Before I move on I’ll show you our announcement. We used the first one (just the baseball gloves and hats). We really wanted to have our pup in the picture, but when you look at that picture on a phone the little ball with the due date (AKA the big clue that this is a pregnancy announcement) just doesn’t seem very obvious. My wife posted the pup pic the next day 🙂 I was happy to be able to reference our infertility journey as well. By way of explanation: I am from Cleveland and Em is from Philly – hence the hats. Also our dog was freshly groomed. She’s always beautiful but not always that shiny. Have you started to show yet? I can tell that my lower belly has popped. This is mostly evident in not being able to put on any pants that don’t have an elastic waistband. But I don’t think I’m “showing” in terms of other people noticing. Also, of note, I am not a skinny person and I carry all of my weight in my abdomen. So, basically, I already looked a little pregnant and now it’s just kind of true but not very different. Sleep: My new normal is waking up at least once each night to pee and/or because I’m uncomfortable. I think it may be time for a Snoogle but that is not going to help the needing to pee at 3am every night problem. It should hopefully, however, help my other problem, which is that I go to sleep every night on my side and I wake up every morning on my belly. Everything I’ve read has said it’s okay to sleep on your stomach until your body tells you not to, but I’m a tummy sleeper so I am really trying hard to train myself to sleep soundly on my side instead. Anyone have any luck with that? Best moment this week: I had some great moments the past 2 weeks. Highlights: I bought a new car (upgraded my ’06 Corolla to a new Subaru Forester! So pumped about it! ), we saw the Indigo Girls in concert again (they’re always so great live), and had a long weekend off work! Life is good. Miss Anything? Nothing right now. I’m happy camper. Wait, actually, I miss allergy medicine. I know that I’m technically allowed to take it but I’m trying to be conservative with all meds so I’ve decided to only take Claritin if I’m really uncomfortable. So instead I’ve just been mildly uncomfortable all of the time. Like, on the verge of sneezing at all times. Movement: Oh man, I want to feel the baby move so bad. I know I could at any moment so I spend way too much of my day sitting still and concentrating on my uterus. Nothing for certain yet, but I have had a few times that I thought I maybe felt something? But then I decided it’s probably just my heartbeat or gas or something. Food cravings: All of the watermelon. I eat like 1/4 of a watermelon per day on average. Also just fruit in general. I’m all about the fruit right now. I have also noticed that, in addition to having my appetite back, I get hungry faster. I’m trying to change my situation so that I’m eating a little less at each meal and snacking more. Anything making you queasy or sick? I still get kind of overwhelmed by the smell of foods cooking/existing (especially dinner food/meat). But the nausea has gone away thank goodness. Symptoms: Symptoms have been pretty minimal! I’d say just a slightly increased sense of smell, trouble sleeping, and some occasional back pain are basically it right now. Purchases: DOES MY SUBARU COUNT? You guys, I’m so excited about my new car. I’ve never had a new car, and didn’t even plan to buy a new car this time around, but apparently Subarus hold their value really well and the used cars were just not enough less money for me. I get a mega sweet discount on new Subarus only by being a member of the American Speech Language and Hearing Association (the one perk ever of being a speech-langauge pathologist), and the new Forester with my discount was only like $1000 more than a used Forester from the past 3 years or so. 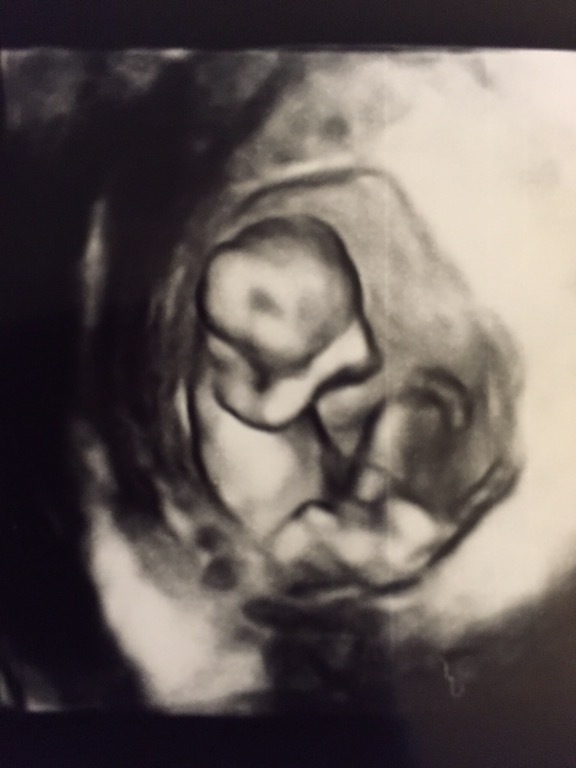 Looking forward to: OB appointment next week (I’m getting antsy to hear the heartbeat again – especially since I haven’t felt any movement yet), and my big ultrasound/anatomy scan the following week. Posted in pregnancy and tagged lesbian pregnancy. Bookmark the permalink. Maternity clothes: I don’t really need maternity clothes yet because I have dress pant yoga pants that I wear every day and my shirts still fit fine. But I’ve been looking online. And I might hit up Kohl’s today to check out their (probably minimal) selection. Coming out of the baby closet status: Things are really rolling in the coming out department! The whole team (except the new OT who I don’t know very well) at work now knows. My boss was barely awkward and actually rather sweet and congratulatory, so that was really nice. I haven’t talked to HR yet but I will in the next week or so. I also told my close friends from college and we’re working on trying to get together with our little group of queer lady friends this weekend to tell them. Basically ticking off the important people who wouldn’t want to find out via Facebook. The big Facebook announcement will come soon as well – in the next week or two? Em doesn’t want to do a photo announcement but I really do. I love seeing them and am so excited to finally be in the club where I can do one. Have you started to show yet? So bloated all the time. What is with all the bloating? Sleep: The exhaustion is fading but not gone. I still have my moments, but I’m really enjoying being able to stay up a little later. Best moment this week: Telling people has been gloriously awkward (I don’t know why I’m so awkward when I say “I’m pregnant” – I think the emotions behind it really take me back to coming out when I was 18/19?) and so joyful. I also had my first appointment with an OB (the very first appointment was with a midwife) on Tuesday and got to hear the heartbeat again. It was in the high 150s/low 160s apparently. Man, hearing that heartbeat is just such an awesome confirmation. I don’t think I’ll be totally confident he pregnancy until I can feel the little one move. Oh, I’m also officially off of all medications except for the prenatal vitamin! I stopped the baby aspirin last week and the metformin on Tuesday. That was what I was really looking forward to meeting with an actual doctor for. My midwife had finally gotten back to me about the meds last week and told me to stop the aspirin and then to stop the metformin “when you’re 12 weeks” … but I was already almost 13 weeks when she sent it. That didn’t inspire a whole lot of confidence so I decided to wait until I could talk to the doctor to stop the metformin. I basically wanted to discuss whether staying on through the pregnancy was an option, as I’ve heard being on metformin may be helpful for women with PCOS when it comes to breast feeding, which is definitely something I’m worried about. The OB said that being on met may mask insulin resistance to a certain degree, and it’s not the most effective treatment for gestational diabetes. That’s enough of a reason for me. So anyway, no more drugs in this pregnant lady. Miss Anything? Having my full energy. And wine. And sushi. Food cravings: Pickles and also fruit. All of the fruit. Especially watermelon. Anything making you queasy or sick? The smell of pretty much any cooked food, especially meats of all kinds. Symptoms: A nose like a dog, food aversions, improving nausea (though I did get sick this week), improving fatigue, headaches, sciatica. Oh the sciatica. Purchases: Nothing yet but I’m getting excited to think about registering. Looking forward to: Telling people, coming up with a photo announcement, actually looking pregnant (I have a while for that one), feeling the baby move, registering for things. Posted in pregnancy and tagged 14 weeks, bumpdate, lesbian pregnancy, pregnancy. Bookmark the permalink. Oops! Totally missed my update last week. Here I am though. 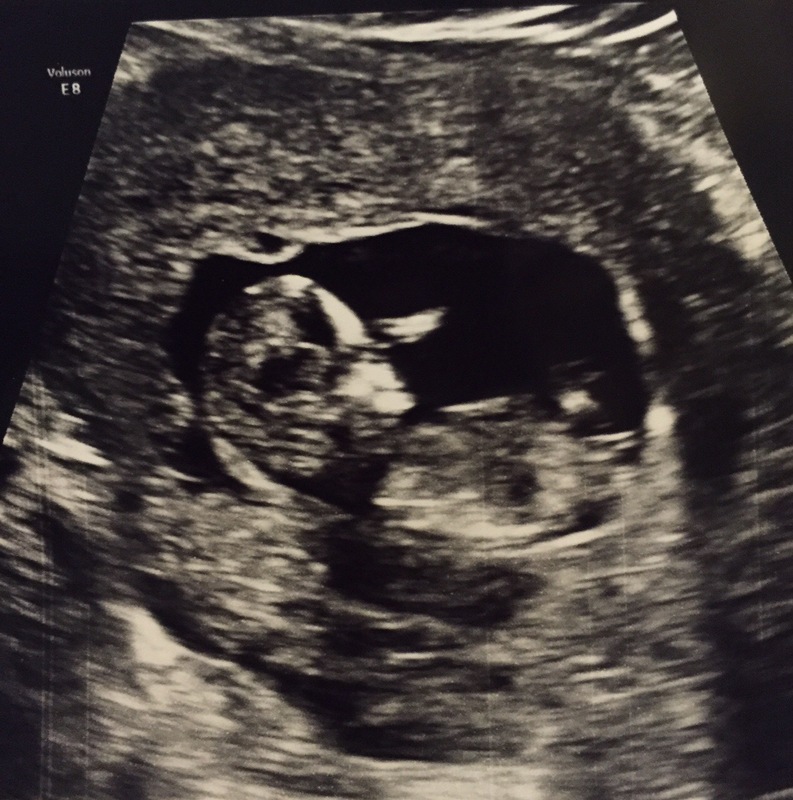 Most exciting part of the last two weeks was my 12 week ultrasound (early genetic screening). Everything went well, we got to see our little one again, and my results came back as low risk. Little one was moving around like crazy and it was actually hard for the u.trasound tech to het his/her heartbeat because (s)he kept moving right when she had it lined up. She ended up coming back to it at the end and little one finally cooperated. 154 beats per minute! Obligatory creepy 3D image! little one was covering his/her face with their arm so no cute little face shot – but look! It looks like a real baby! This weekend my parents are here. The weather in Boston is not cooperating (it’s been gloomy and rainy with no peeks of sunshine since mom got here on Wednesday) but it makes me so happy yo have them here. Lots of pregnancy excitement and little house projects getting done. On to the bumpdate! And a very Happy Mothers Day to all you moms, moms-to-be, moms at heart, and one day moms. I know Mothers Day is hard when you’re in the throws of infertility (man do I remember that) so I hope y’all are taking some time to yourselves and letting yourself feel whatever you need to feel this weekend. Oh, and happy derby day. Maternity clothes: Permanently in the land of stretchy waistbands because holy comfort, Batman. When I say permanently, I mean that I started before I got pregnant and never plan to stop. I have been looking online for maternity clothes which is depressing because where are all the maternity clothes for people who are not into leggings and flowy shirts? Sigh. Coming out of the baby closet status: We are in sight of being fully out of the baby closet! We are officially telling people as we see them, and today the mass e-mails went out to the extended family. I have 30something aunts and uncles and 42 first cousins, so mass e-mails are really the only way to go. It feels great and also scary to have the information getting out more broadly. I’m planning on telling my boss and HR on Monday/next week, so wish me luck. My boss is the most awkward human alive so I’m not sure what to expect. Best moment this week: The ultrasound for sure last week, and my parents being here this week has made me really happy and excited about their transition to grandparent-hood. Food cravings: I’m really into pickles right now. Anything making you queasy or sick? Smells mans. All food smells. Looking forward to: OB appointment this week (hearing a heartbeat again hopefully! ), coming out of the baby closet entirely, and getting my appetite back. Posted in pregnancy and tagged 13 weeks, 13 weeks pregnant, bumpdate, IVF, lesbian pregnancy, pregnancy. Bookmark the permalink.